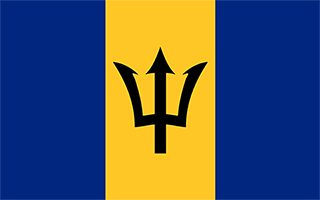 Barbados with its capital Bridgetown is located in North America (Caribbean, island in the North Atlantic Ocean). It covers some 431 square kilometers (2.5 times the size of Washington, DC) with a population of 292,336. English is the language spoken by people in Barbados. There are no land based border this country shares with any other country. Barbados is an island in the Caribbean, northeast of Venezuela. The island is portrayed as the Little Britain of the Caribbean because of its long association as a British colony. The name Barbados comes from a Portuguese explorer named Pedro Campos in 1536, who originally called the island Los Barbados (The Bearded Ones), after the appearance of the island's fig trees, whose long hanging aerial roots resembled beards. Driving is on the left. The bus system is extensive, cheap, and fast - if you're headed to somewhere on the main route - but a car (or mini-moke) is the only way to see many of the out-of-the-way sights. The local currency is the Bajan dollar, but US dollars are accepted just about everywhere in shops and restaurants. The exchange rate is fixed at 1.98 Bajan dollars to the US Dollar but almost everyone uses US$1 = BD$2. To reach someone Barbados dial +1-246 prior to a number. The local cellular networks are operated on 900 MHz, 1800 MHz, 1900 MHz, 3G, 4G. Websites typically end with the top level domain ".bb". If you want to bring electric appliances (e.g. battery chaarger), keep in min the local 115 V - 50 Hz (plugs: A, B). The sign for the locally used currency Dollar is BBD. Three equal vertical bands of ultramarine blue (hoist side), gold, and ultramarine blue with the head of a black trident centered on the gold band; the band colors represent the blue of the sea and sky and the gold of the beaches; the trident head represents independence and a break with the past (the colonial coat of arms contained a complete trident).